PTTDX: an intermediate-term bond fund consisting of US Treasuries (37.4%), US Corporate (21.8%), Mortgage Pass-Through (13.1), Mortgage CMO (9.2%), Foreign Corp. (8.1), and Other (10.4). General Risk: You need to further evaluate PTTDX thoroughly. Well-informed, you decide what to do. Remember that there is risk of loss in all trading. I don’t own any PTTDX shares. Here are the pluses and minuses. + Annualized Return: The 10-year annualized return is 7.53%. 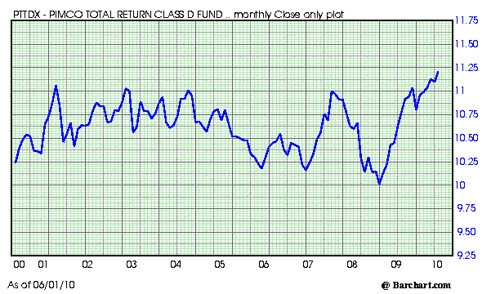 The annualized return since inception is 6.87%. – Inflation Risk: If inflation increases to a percentage greater than the bond-fund yield, the bond-fund holder would consistently lose money. – Interest Rate Risk: When interest rates go up, bond prices move inversely and go down. – Monthly Dividend: As of 5/28/10, $2.33 per 100 shares (2% yield). + Net Expense Ratio: 0.75%, Category average is 0.99%.